Salmon are caught all over Marine Area 7, from the nooks and crannies of the interior Islands, to the outer banks of the Straits. The ‘Juan’s can be a hard nut to crack, but it helps to think of the Islands like a big rock pile in the middle of a river. It’s all about tide. When the tide is flooding it pushes in from the Straits of Juan De Fuca, and when it ebbs, it flushes down the Straits of Georgia, and back out. This creates a “river” flowing through structure. Behind points, over drop offs, in trenches, pockets, and seams, anywhere bait can get out of the current, Blackmouth will be there to feed. When the tide goes slack, salmon attack! This is a downrigger fishery. Trolling is mostly done with the tide, shooting for around 2 mph. The fish will mainly be holding on the bottom. What you use for terminal tackle is not exotic. Spoons, hootchies, herring. The main food source for these salmon is small Herring and Sandlance. Matching the size of baitfish is important, and it’s usually smaller. Rig your offering behind a flasher, which mimics a salmon slashing through bait, and the lure looks like it’s a stunned baitfish just ready to be chomped! There is no substitute for experience on the water, so getting out there in the San Juan Islands is not only enjoyable, but it will make you a better fisherman. The scenery isn’t bad either! Fishing the San Juan Islands can be very productive. Lime Kiln Point is located about 4 miles west of Pile Point. This is not an especially good winter Blackmouth fishery, not because the fish aren’t there – they are! However this area is very exposed to the weather and it is a long run to sheltered water. Much of the summer fishery is very close to the shoreline. For Chinook, try to stay in the 40 ft to 90 ft depths. When fall Coho arrive, pick a tide rip and go for it. A number of tide rips will form just to the south of Lime Kiln Point. The top 60 ft of water is usually the area for lots of Coho, however some of our biggest Coho have come while trolling 150 ft deep in late September through October. Pile Point – Just to the northwest of False Bay. The bottom contours are quite steep here. This is an excellent spot on either the ebb or flood tide. Moochers and jiggers do quite well here. You must be aware of the fishing closures in and around False Bay. Off shore trollers will do well here on the ebb tide, as Chinook, Coho and Humpies will school up in this area. You can actually troll from Salmon Bank to Pile Point and pick up salmon all along the way. Fish the rips hard for Coho. 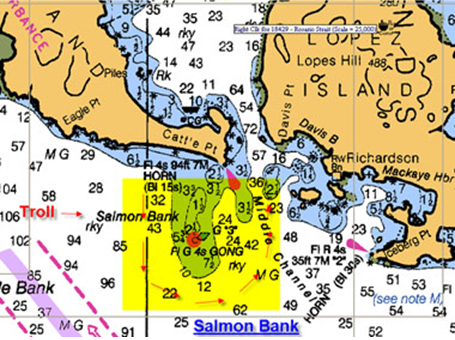 Salmon Bank is one of the most productive areas to fish in the San Juan Islands. 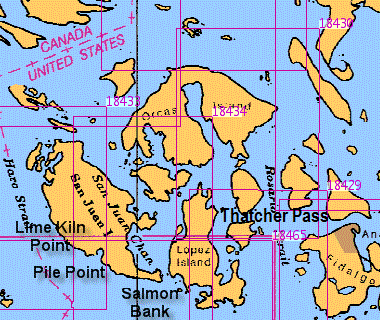 Halibut, Winter Blackmouth, Coho and summer Chinook all pass through this area. Unfortunately the western portion of Salmon Bank has been closed to salmon angling for the past few years and this may not change in the near future. Always check your regulations before fishing this area for seasons and area closures. If Salmon Bank has a fault; it would be its exposure to weather. It is susceptible to afternoon winds blowing down the Strait of Juan De Fuca and/or winds out of the south or east. Because Salmon Bank’s reef extends far out into the straits, a tide change, coupled with a wind in the opposite direction can kick up some rough water. It’s certainly not a place to be during a storm or strong winds. Fortunately, it is a short run to Cattle Pass and sheltered water. Anyone who has fished Possession Point will immediately notice a similarity in the tactics that you use here. Let’s start with the east side of Salmon Bank. This is best fished on the incoming tide. This is an excellent area for winter Blackmouth, as it usually holds bait. The troll area is about 3 miles long. It is best fished with downriggers. Winter Blackmouth are fished in the bottom 10 to 20 ft of the water column. Fish parallel to the bank in 80’ to 160’ depths. 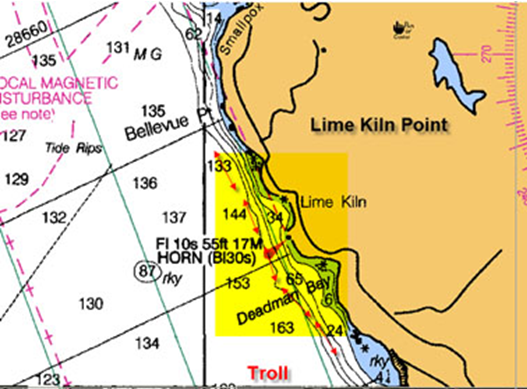 Start your troll at the south end of the bank and troll towards Cattle Point. Wintertime means the primary bait in the area will be sand lance or candlefish. Coho killers and #3 Kingfisher spoons made by Silver Horde fished behind a flasher can be deadly here. 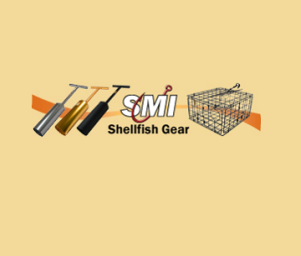 As can Gold Star needlefish squid. With both spoons and squid, stay with your glow in the dark colors in green, purples and army truck. It is fairly common to hook halibut here while trolling for winter blackmouth. However, the Halibut season doesn’t open until May. So, once again check your regulations. While downrigger fishing is the most effective way to fish this area, moochers can go up on top of the bank and let the tide push them to deeper water, keeping their bait in the bottom 10 feet of water. A good starting point for moochers is the Salmon Bank buoy which is in only about 40 feet of water, however the bottom quickly falls off from there. As you approach Cattle Point, the bottom becomes quite rocky and many a downrigger ball rests here. 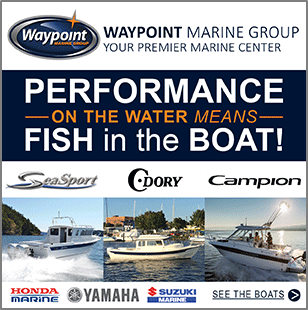 The rocky areas are an excellent area to mooch and are also an outstanding area for lingcod. At the present time, the western portion of Salmon Bank remains open for fishing year round. 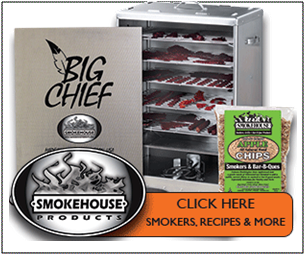 It can be an excellent spot for summer Chinook as well as Humpies and Coho. Usually you are able to troll parallel to the bank in either direction, an oddity, because the current flow is at right angles to the bank. Winter Blackmouth fishing mirrors the east side fishery. This area is best fished on the outgoing tide. Summer Chinook will often suspend so that while you may be over 150’ of water, the Chinook may be only 50 to 70 feet deep. Good Lowrance electronics are vital for your summer fishery. Fish where you see bait suspended. The 5” Silver Horde plugs fished 35 to 50 ft behind your downrigger release will certainly add fish to your box as will the usual baits; squid, herring etc. However, plugs will usually catch you bigger salmon. During the odd year are Humpie runs. Massive schools of humpies will hold on the outgoing tide on the western side of the bank. These are easily caught and usually taken in the top 60 feet of water. Those people trolling with divers or sinkers will catch a lot of humpies without the need of a downrigger. Those with downriggers will quickly limit. Coho in the Salmon Bank area can be anywhere – up close to shore, or far off the bank. It’s a hunt to find the schools. Both humpies and Coho will usually show themselves by jumping or rolling on the surface. So find yourself a good rip to troll along, and keep your eye out for splashing fish. A short run from the Washington Park Boat Launch in Anacortes is Thatcher Pass. The Washington State Ferries run through this on their way to and from the San Juan Islands. Thatcher Pass is one of the better spots for Winter Blackmouth. 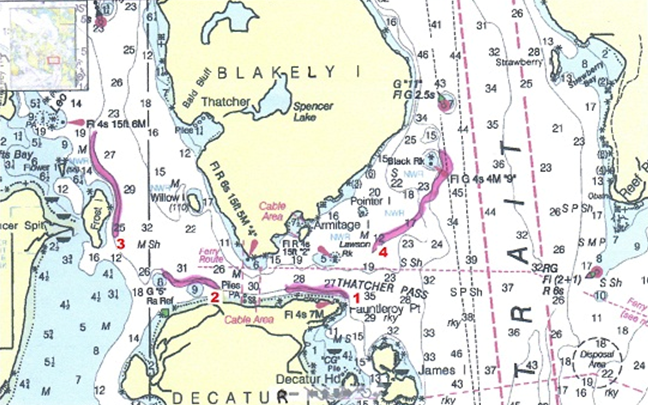 Located between Blakely Island on the north and Decatur Island on the south. Thatcher Pass gets a good mixture of currents that will hold bait, thus attracting Blackmouth. 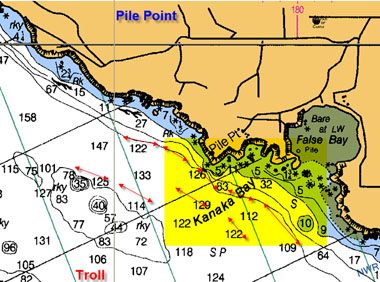 Area 1 is best fished trolling from Fauntleroy Point into the pass. When you reach the first of those houses on the north shore of Decatur a reef comes up quite quickly. Make a hard right turn and parallel the reef. Blackmouth and bait will hold along the face of the reef. After you have trolled around the face of the reef, run back down to Fauntleroy Point and repeat your troll. Start your first pass at 100′ deep, the second at 125′ deep and the third at 150′ deep. No fish? – move somewhere else. Moochers or jiggers of course can sit on top of the reef and drift off on either tide, drifting down the face of it. Area 2 After you go west past the cable crossing area and the piles, once again you have reached a good holding area for bait and fish. Watch the bottom contour closely if you are trolling as it goes up and down quickly. Area 3 A nice troll area from a mile above Frost Island to just below Frost. Not a Hotspot, but you can catch the occasional Blackmouth in this area. Area 4 A fair Halibut area around Black Rock in the early spring. 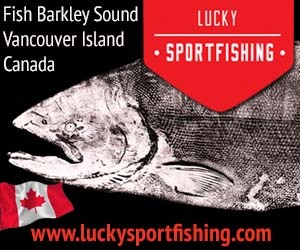 An excellent spot for Chinook and Coho during the summer season. Chinook and Coho migrating to the Fraser River will pass through this area. Chinook tend to stay in the 90′ to 100′ depths. Coho could be close in or further out. The schools of Coho will often show themselves by jumping and splashing the top of the water. Be careful when downrigger fishing as the bottom comes up and down very quickly and it is rocky and grabby. The best troll in summer time is from the Lawson Rock area to Black Rock. Watch the Bottom!